Homosassa Landscaping Design Center, Water Gardens, Pavers, Retention Walls, Block Walls in Citrus County Florida. Replacement plants available to spruce up your yard and replenish mulch beds. Trying to sell your home? Let us freshen up your landscaping to make the right first impression. Free Estimates. We also do driveway pavers and retention walls & steps. The Florida First Landscape & Design pros are truly artists in work boots - creative beyond belief! We used to have just an ordinary backyard. Now we have our own tropical paradise! Established in 1991, Florida First Landscape & Design is a landscaping company offering design and installation of water gardens and waterfalls, pavers and retaining walls. 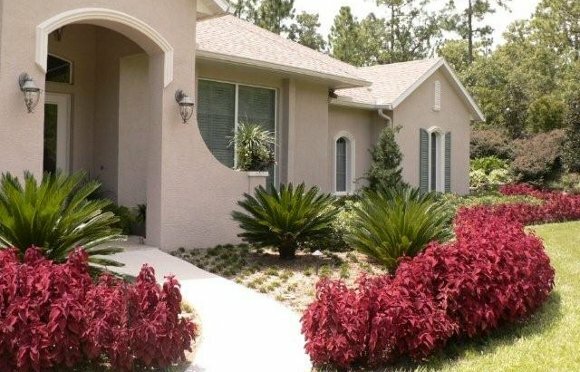 Florida First Landscape & Design in Homosassa Florida offers complete Florida landscaping solutions as well as water garden design and installation, driveway pavers and patio pavers, retaining walls, and more. Florida First Landscape & Design also has expert knowledge of Xeriscape landscaping specifically tailored to the Citrus County climate. Xeriscaping refers to landscaping and gardening in ways that reduce or eliminate the need for supplemental irrigation. Plants whose natural requirements are appropriate to the local climate are emphasized, and care is taken to avoid losing water to evaporation and run-off, thus conserving water. Advantages of Xeriscape include; lower water consumption, more water available for other uses, less time and work needed for maintenance, little or less lawn mowing (saves energy). Xeriscape plants along with proper bed design tends to take full advantage of rainfall and when water restrictions are implemented xeriscape plants will tend to survive while more traditional plants may be unable to adapt. Florida First Landscape & Design has accumulated a vast amount of experience over the years. This coupled with ongoing education and up-to-date training of the staff has enabled Florida First Landscape & Design to keep abreast of advances in new landscaping technology as well as the latest trends and materials for home landscaping and commercial landscaping. Let Florida First Landscape & Design take the work and worry out of designing the perfect landscape for your home from landscape lighting to water gardens.